Max’s birthday party is next week, and what with Crochetvolution coming out this week – you went to see it, right? – I’m a little underprepared. In fact, according to my pinspiration board (you like that?) I have about seven cakes to make, eight games to put together, ten party favors to craft and a wide variety of things to glue bird faces to. Hah. First up in the glued faces department, tote bags! I found these tote bags for a dollar apiece. They had very, very small ones (4 or 5 inches square) at three for a dollar, but that wouldn’t hold some of the favors I’m putting together, so big ones it was. We’re inviting four boys this year, plus Max and Charlie, so everything we make has to be in multiples of 6. Also, believe me, green was not my first choice, but it was that or pink, and I thought my chances of convincing the boys that pig bags were cool was higher than the same thing for pink bags. 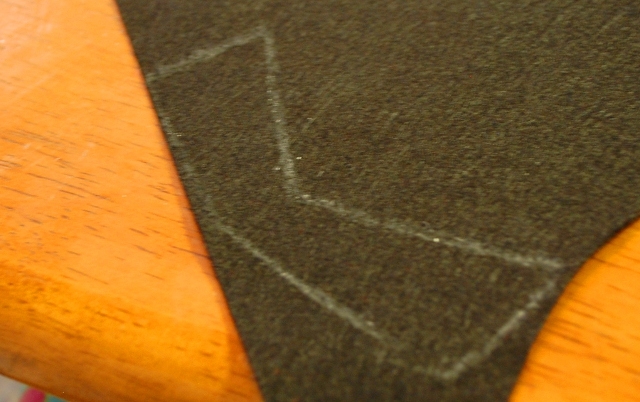 White crayons show up beautifully on black felt. They will, however, accumulate fibers and quickly stop writing, so you need to either clean or sharpen the writing surface frequently. Once you have all your pieces cut out, arrange them to your liking, glue them on, and draw details with the Sharpie. 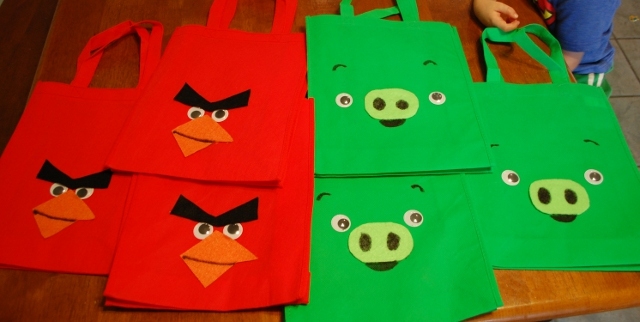 All I had to buy for these was the bags themselves, the eyes, and two sheets of felt, so these come out to $1.25 apiece. Not bad for something that the kids love! Now all I have to worry about is what will go in them.